United Launch Alliance reveals launch costs with "RocketBuilder"
Rocket-builder United Launch Alliance unveiled a first-of-its-kind website Wednesday that shows potential customers exactly what it will cost to buy an Atlas 5 booster, along with expected savings based on the rocket’s demonstrated reliability, ULA’s on-time launch record and the company’s sophisticated guidance system. The new “RocketBuilder” web tool, reflecting ULA’s ongoing push to streamline operations and lower prices, shows that an entry-level Atlas 5, capable of boosting a small to medium-size satellite to the high orbit used by communications stations, would cost $109 million -- $75 million less than the same rocket cost just a few years ago. “So $109 (million) is a pretty big change,” ULA CEO Tory Bruno told reporters. “And that is the result of an entire company transformation we’ve been going through. We have entered into strategic partnerships in our supply chain and achieved vast savings there. We have streamlined our operations, taking advantage of our 10 years of experience. While the $109 million version of an Atlas 5 costs nearly $50 million more than a SpaceX Falcon 9 rocket, Bruno said the actual out-of-pocket cost for a customer buying the Atlas 5 is around $44 million when “added value” savings are figured in by RocketBuilder. In the $109 million example, which assumes a satellite value of $300 million -- typical for this variant of the Atlas -- projected insurance savings based on the rocket’s failure-free launch history would be $12 million. Bruno said the industry average for delays, from the point a contract is signed to a satellite’s eventual launch date two to three years later, is about 4.5 months. ULA’s average is two weeks or so. RocketBuilder calculates how much revenue a given satellite operator could expect to lose based on that industry average. In the $109 million example, that works out to $23 million in savings. Bruno said the sophisticated guidance system of the Atlas 5 system means ULA typically delivers satellites to ultra-precise orbits, reducing the amount of on-board fuel needed to fine-tune a spacecraft’s path. On average, that can increase the satellite’s life by up to two years or so, he said, adding another $30 million in savings. All together, RocketBuilder says the buyer of that $109 million Atlas 5 would save $65 million, making the actual out-of-pocket cost just $44 million. “When you’re a commercial operator, it’s very difficult to get clear transparency around all of these costs so you can do meaningful trades and build a real business plan,” Bruno said. “But today, all that changes. United Launch Alliance is a partnership between Boeing, builder of the Delta family of rockets, and Lockheed Martin, which builds the Atlas 5. The more expensive Delta rockets, now used exclusively for military and other government payloads, have a record of 33 successes and no failures since the booster’s debut in 2002. 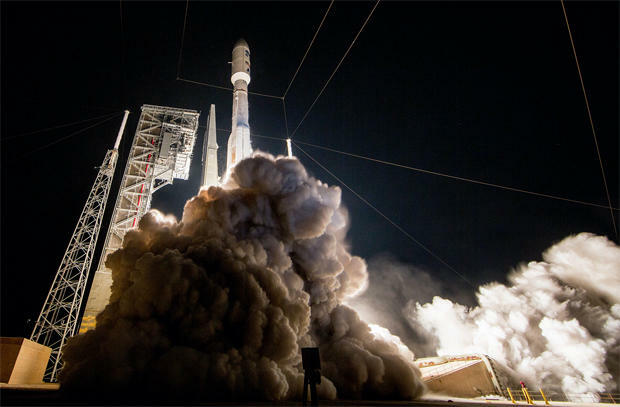 The Atlas 5 record is 67 straight successes over the same period. The European consortium Arianespace is the world leader in commercial launch services. Its Ariane 5 rocket, which typically launches two satellites at a time, is believed to cost between $150 million and $200 million. Since 2003, the consortium has launched 75 flights in a row without a failure. SpaceX is ULA’s primary U.S. competitor, launching 28 Falcon 9s since 2010, including one in-flight failure in 2015. Another SpaceX Falcon 9 exploded on the launch pad Sept. 1 during a pre-flight test and it’s not yet known when the company plans to resume flights. But SpaceX founder Elon Musk’s drive to lower launch costs, the company’s ongoing efforts to develop innovative reusable rocket stages, sharp criticism of ULA’s use of a Russian-built engine in the Atlas 5 first stage and a successful push to win military launch contracts have shaken up the rocket industry. Bruno did not mention SpaceX during his discussion Wednesday, saying only that ULA is continuing its own efforts to lower costs and increase transparency. He said the RocketBuilder tool is a major step in that direction.